I love working with a team to organize an event. 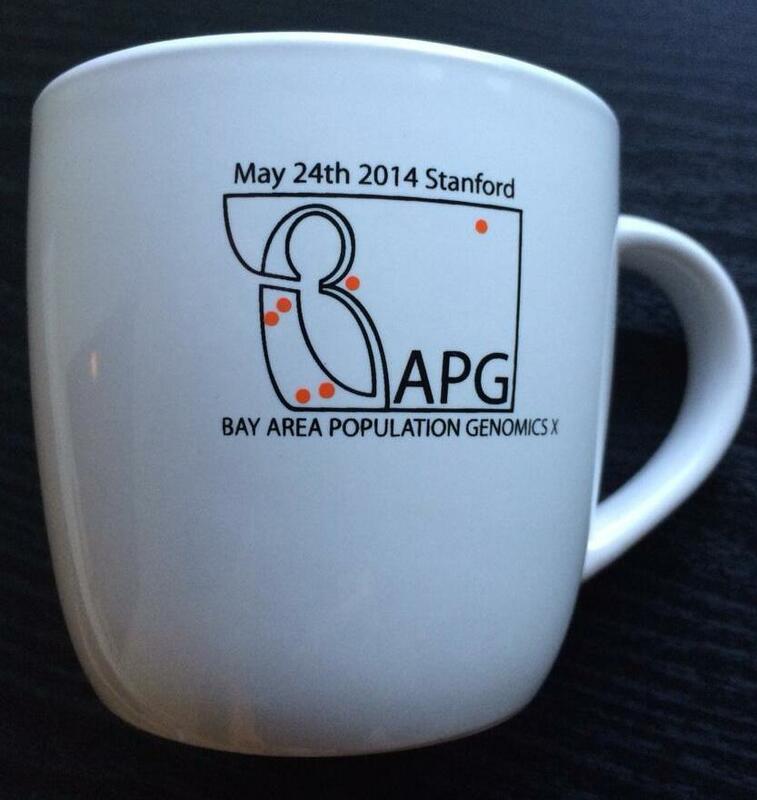 The tenth Bay Area Population Genomics conference (BAPGX) was a fun event to organize. It is part of a successful series of conferences and there was plenty of support, both at Stanford and from the community, to organize it. 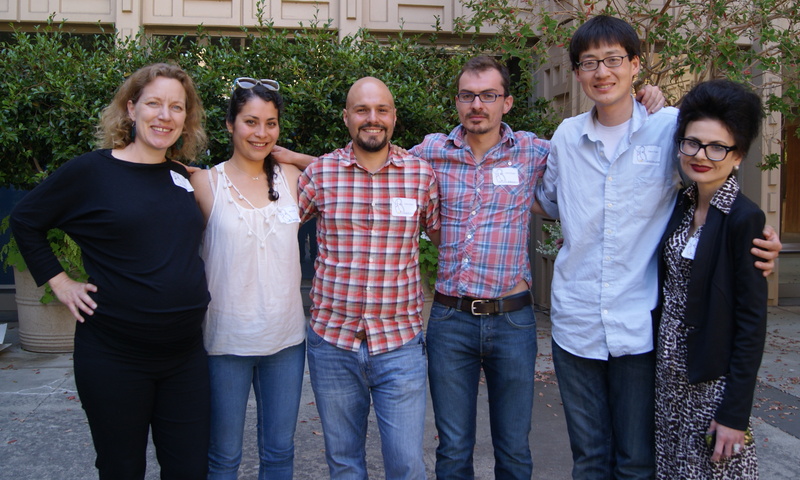 Five Stanford postdocs volunteered to help out and did a great job. I think the conference was a success. Here are some of the things we did to make it that success. Dmitri Petrov (who initiated the BAPG series) asked me (Pleuni) if I could organize the conference. Dmitri and I picked a date (not realizing it was Memorial day weekend!) and after that I was free to organize it the way I wanted. I asked the CEHG mailing list for volunteers and –within 10 minutes!– found five postdocs who were willing to help me organize the event. We were ready to get started! The BAPGX committee, Pleuni Pennings (@pleunipennings), Maria Avila (@maricugh), Carlo Artieri (@Carlo_Artieri), David Enard (@DavidEnard), Dave Yuan (@13bee_slurpee), Bridget Algee-Hewitt (@BridgetAH), Dmitri Petrov (@PetrovADmitri, not in the picture). The BAPGX committee met 3 times. The first meeting was mostly to brainstorm, the other meetings were more focused on logistics. We sent many (many!) emails within the committee. We kept notes and files in a shared folder on Google Drive. We split tasks: Bridget was in charge of communication with speakers and participants. Carlo was in charge booking the location, catering, and poster boards. Maria was in charge of mugs and name stickers. David was in charge of the logo and photography during the event. Dave was in charge of wine and cheese and printing the schedules and signs. Pleuni was in charge of the website, Facebook, twitter and the money. We decided on the program (and many other things) together. There was a BAPGX mug for every participant. 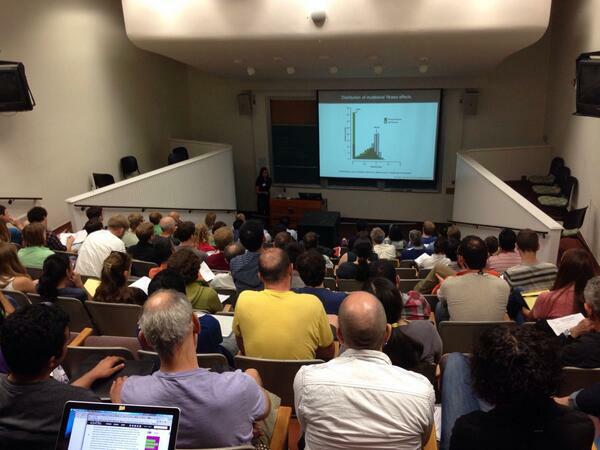 We looked at several lecture halls at Stanford and chose M106 in the Alway building, even though it wasn’t fancy, because it had the right size (140 seats) and was adjacent to a courtyard (great for registration, breaks and posters). It was also good because people could take their coffee with them into the room and because we could order food from an outside vendor. We decided to start the conference at 10AM, so that it was convenient for people who wanted to take the Caltrain (the first arrived at 9:17 in Palo Alto). We put up some signs to make it easier for people to find the Alway building. We encouraged people to ride share and included a column in the registration Google doc with ride share information. We had two of our committee members (Maria and David) in and at the Caltrain to guide people to the lecture hall. We made sure the lecture hall would be open on the day of the conference. Two of us washed all the mugs and four of us went to Costco two days before the conference. 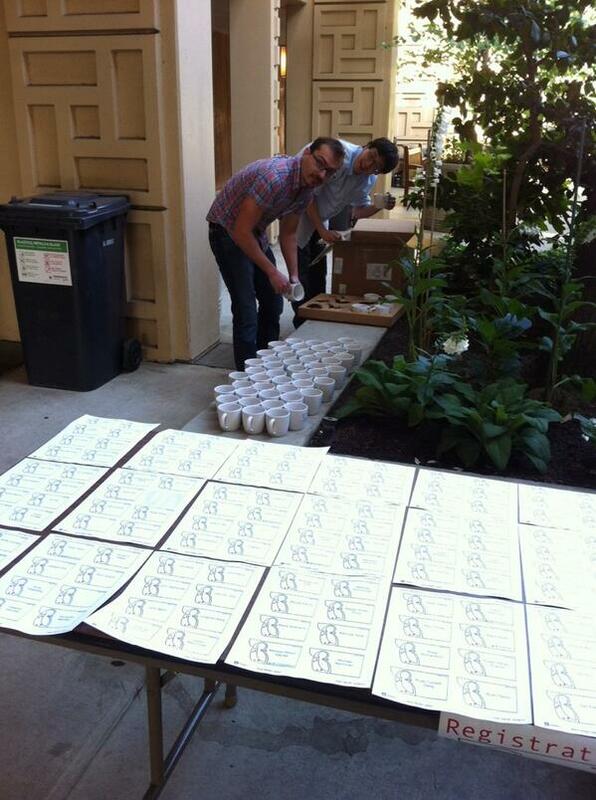 Dave and David are preparing the registration area. Registration was free and open to all. We decided to cap participation at 150 (even though we had only 140 seats) under the assumption that some people would cancel or not show. To sign up, people simply added their name, email, affiliation, food preference, whether they’d bring a poster and ride shareride share info to a Google doc. A few days before the conference we “locked” the Google doc and asked people to email us instead. We reached 150 registrations around one week before the conference. After that approximately 10 people canceled and around 5 additional people were admitted. A few people didn’t show up and a few crashed the conference, but this was no problem as we had enough seats and food. One of the great things about working with an active community and a motivated committee is that we could build a lot of momentum before the conference. The committee communicated with the community through emails (to individual people, to the speakers and the poster presenters and to the BAPG Google group). We hoped for participation from many different universities and made additional efforts to encourage people from SFSU, Santa Clara and UCSC to sign up. We also had participants from UCSF, UC Davis, UC Berkeley, the Cal Academy of Sciences, Ancestry.com, Stanford and a few other institutions. We used twitter (all committee members are on twitter). We decided on a twitter hashtag early on (#BAPGX). We used Facebook (through the CEHG Facebook page). We tried to keep everyone updated on the program and everything else we were working on (logo, mugs, cheese etc.) to show that we were working hard and that we were excited about the conference. We received financial support from Ancestry.com and from CEHG (thank you!!). For the CEHG money we had to write a short proposal, but basically used the same text as we already had on the website. We spent money on food and coffee ($2,266), water, juice, soda, wine and grapes ($711), cheese ($430), mugs ($715), and name stickers ($76). We saved money by buying water, juice, soft drinks, wine, crackers, grapes, paper plates and plastic cups at Costco. We also saved money by using stickers as badges (instead of more fancy badges). We saved money by not video-recording anything. We decided not to spend any money on inviting an outside speaker or gifts for speakers. We got help with the financial administration from CEHG (Cody Sam) and from Elena Yujuico (Dmitri’s admin). We didn’t realize until fairly late that we planned the conference in Memorial Day weekend. We didn’t think about Wi-Fi access for guests until the night before the conference. On the day itself we created a guest login for the Stanford network and that worked. We were not consistent about the length of the normal talks. We originally announced that they’d be 12 minutes (+3 minutes for questions), but then this somehow became 15 minutes (+5 minutes for questions). We allowed for normal talks (15 min) and mini talks (5 min) and got an equal number of abstracts for both. We set a deadline for talk submissions (4 weeks before conference) and another deadline for registration (one week before conference). We asked people to submit abstracts (this was not done for previous BAPG conferences. 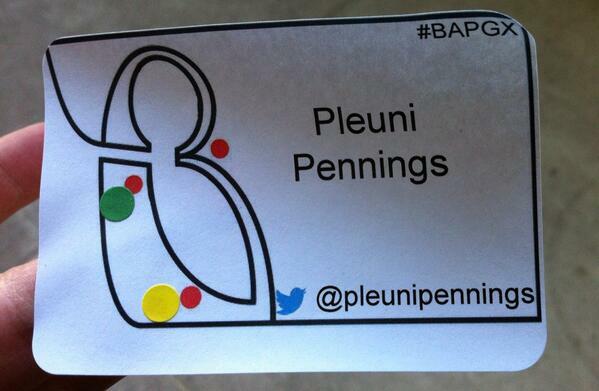 At previous BAPG conferences, people were encouraged to add their name in a Google doc to sign up for a talk, but we thought that making the process a little more formal would get us different speakers and potentially more well-prepared speakers). We accepted all talks that were submitted before the deadline (but none that were submitted after). Our program was a bit longer than previous BAPG programs, because we decided to accept all submitted abstracts and because we wanted to be sure there was ample time for questions. We organized a practice-your-talk session for the speakers from Stanford. Participants were encouraged to bring a poster. No titles or abstracts needed, just a “yes” in the right column in the Google doc. 11 People signed up to bring a poster, in the end there were 9 posters. We borrowed simple poster boards from the Beckman center and brought pins and tape (We considered higher quality poster boards, but they would have cost around $500 rental fee at Stanford). Posters were up the whole day (from the coffee break in the morning). All of the committee (except Maria who was on the Caltrain) met at 7:30 to set up everything for the day. We made sure we each had all the other phone numbers. We brought several computers, VGA cables, thumb drives etc (but in the end all worked from the computer that was already in the lecture hall). We brought plates and knives for the cheese and grapes. We asked Dmitri Petrov to say something at the start of the conference. We split chairing between three members of the organizing committee (Carlo, Maria, David). Bridget and Pleuni “manned” the registration table from 9 till 10:30 and explained to everyone how to indicate their affiliation on their name sticker. Name sticker with associations indicated (a yellow dot at the approximate location of Stanford and a green dot at the location of SFSU). We had fairly long breaks and allowed plenty of time for questions. Each session ran a few minutes late, but we caught up during the breaks. Each of the members of the organizing committee missed at least one of the sessions to be outside to handle food. David brought his camera (photo’s will follow!). Originally we had someone (not the chair) assigned the task of keeping track of time during the talks, but in the end we decided that it worked better if the chair did it him/herself. We all stayed till the end and cleaned up the mess. We found a home for the leftover mugs & the leftover wine and cheese. We sent an email to all participants to thank them for coming & for great talks and posters & to tell them about the storified tweets. We plan to have a nice lunch or dinner with the committee to celebrate the success of the conference. We’ll round up the financial administration. The talks were of very high quality (thank you, speakers!!). The fact that we asked presenters to send us their slides beforehand may have contributed to that. We got a lot of positive feedback about the mini talks (lightning talks), so it may be a good idea to keep that as part of BAPG. Many people stayed for the posters and cheese. The cheese may have helped with that; we had a Toma (cow’s milk cheese from Pointe Reyes), Comte (cow’s milk cheese from France), Brabander (goat’s milk Gouda from Holland) and Casatica (buffalo milk soft cheese from Italy).